Arthur Miller’s fantastic series “A Baseball Card That Never Was” continues with this stunning entrant featuring the legendary Ty Cobb. 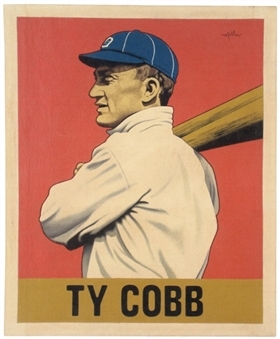 This canvas artwork imagines what a Ty Cobb card in the fabled 1948 Leaf set would look like. Cobb is portrayed in his Detroit Tigers uniform in front of a sumptuous red background. This artwork is a mixed media on canvas. Specifically, the mixed media is acrylic enamel house paint, oil pastels and colored pencils and sealed with varnish. A gold border is located near the bottom of this canvas artwork, with “TY COBB” painted inside in bold black lettering. The back of this artwork has “A Baseball Card That Never Was: Ty Cobb (1948 Leaf)”, “2018”, and Miller’s signature written in black. Miller’s signature is also located on the upper corner of this artwork. This item measures 25 x 30 inches and is a fantastic display piece for any baseball fan.